3-DVD set. Springsteen hadn't played a full acoustic set since the early '70s when he took the Shoreline Amphitheater stage for Neil Young's Bridge Benefit on October 13, 1986. To celebrate that 25th anniversary, this release celebrates a quarter-century of Young's now-annual concerts supporting the Bridge School. Other artists featured on the three-DVD set include Patti Smith, Pearl Jam, David Bowie, Bob Dylan, R.E.M., Emmylou Harris, Bonnie Raitt, Tom Waits. Paul McCartney, The Who, Tom Petty, Simon and Garfunkel, Neil Young and Crazy Horse, and much more, the live performances taking up two discs. A third DVD consists of documentaries including "The Bridge School Story," which gives a special look into this wonderful school and the truly phenomenal services they provide children with advanced physical and communication challenges. 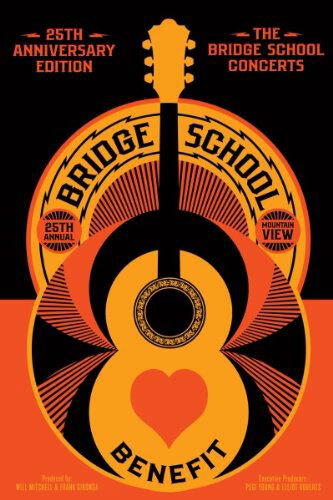 Another documentary on the DVD, "Backstage At The Bridge School Benefit Concert," offers a bird's-eye view of the event itself, along with special features that include heartfelt interviews with the students and the artists themselves.